of hills and valleys and provide glorious views of nature and unveils different facets of history, art and culture. The Kalka-Shimla track spins like a silvery thread across beautiful terrain with tunnels and high bridges and connects Kalka with Shimla. The entire section is built as a rising gradient through the Shivalik ranges. The 96 kms journey by train for 6 hours from Kalka to Shimla offers an unforgettable experience. The Kalka-Shimla railway is often termed as a scientific fiction and is one of the most unique railway tracks of the world. This train crosses through 103 tunnels, 969 bridges, 919 curves (68 km), 20 railway stations and 5 level crossings. This train has also been recorded in the Guinness Book of World Records as “ the greatest narrow gauge engineering in India”. According to the railway chronicles, it is one of the most surveyed project and more people are using this train today, then during the British Raj. The scenery along the route is very magnificent, flanked by the towering hills, the track clings on to the sides of the steep cliffs, and ventures boldly over graceful bridges as little mountain streams gush and sparkle alongside. The trek from Kalka to Shimla is adorned with beautiful panorama of the valley and the picturesque stations like Dharampore, Taksal and Solan along the way. 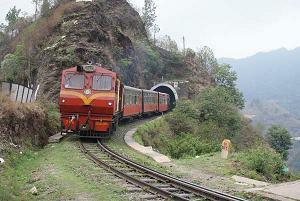 Kalka Shimla Toy Train has about 7 coaches that can accommodate least 200 passengers in a single trip. The diversities of challenging weather do not affect the power of the 700 horsepower B-B type diesel engines. They run energetically taking up the hazards of adverse weather conditions. The train acquires up a moderate average speed of 25-30 km throughout its passage thus allowing its travelers to enjoy the full splendor of the picturesque valley. The age-old communication system, which was used earlier at the stations is still used today. The stations at the route used block phones and control phone system. The block phones establishes links between two stations while the control phone system keeps in touch with other important stations. The lanterns, which were used to stop and give green signals to the trains during the British rule, are still used today. The Kalka-Shimla railway track was first sketched by a correspondent of the Delhi Gazette in November 1847. The project was revised in 1885 but nothing came out of it. Another project report was prepared during 1887 but the construction of the route was not started. Finally, a survey of the train in 1895 paved way for signing the construction contract on June 29, 1898. This contract was signed between the Secretary of the State and the Delhi-Ambala-Kalka railway Company for building and operating a line on 0.79248m gauge. The work on the Kalka-Shimla route was completed on November 2, 1903 and was opened for the general public on January 1,1906. This magnificent train was inaugurated by the British viceroy, Lord Curzon on 9 November, 1903. It is a living tribute to the Engineers who dared to bore 107 tunnels, out of which only 103 tunnels are in use. There is also an interesting story behind the longest tunnel at Barog. This tunnel is crossed in 3 minutes by the toy train. This station is named after Engineer Barog who sacrificed his life here. Just 1 km off the station, lies a tunnel and the grave of this Engineer, who tried to construct this tunnel but failed to align both sides. The wastage of a huge amount of public money forced him to embrace death. If this tunnel had been aligned properly, then it would have been the longest railway tunnel in the world and would have not been running through Solan and Salogra. Besides the Barog Tunnel, other three big tunnels on this route are Koti (2,276 ft), Taradevi (1,615ft) and Tunnel no. 103 (1,135ft).